1.I am delighted to visit Namibia, a nation blessed by Nature, endowed with abundant resources, caressed by the ocean, and inhabited by the brave. I feel truly honoured to have this opportunity to address this august House of the leaders and representatives of the people of Namibia. 2.I am accompanied by Minister of State in the Indian Prime Minister’s Office, H’ble Dr. Jitendra Singh, H’ble Shri Surjit Singh Ahluwalia, Member of the Lok Sabha, the House of the People and H’ble Shri Mansukh Mandaviya, Member of the Rajya Sabha, the Upper House of the Indian Parliament. We bring to you the greetings and best wishes of the people of our country. 3.India was very happy to welcome His Excellency,Dr. Hage G. Geingob, President of the Republic of Namibia, to India when he participated in the 3rd India- Africa Forum Summit hosted by India in October last year . We greatly value the contribution of Namibia to the success of the Summit. 4.My State Visit, the first by a President of India since 1995, takes place at a time of excellent bilateral relations between India and Namibia. India attaches great value to her long standing friendship with Namibia. 5.The India-Namibia relationship has been built on the firm foundation of mutual trust and understanding. Our two nations are bound by our common experience of colonial rule and the struggle of our people for freedom. India believed that her own independence was incomplete so long as her brethren in Africa continued to suffer oppression by foreign masters.India was proud to stand shoulder to shoulder with the leaders and people of Namibia in their liberation struggle. We were among the first nations to raise the question of Namibian independence in the UN. It was India that inscribed on the agenda of the UN General Assembly in 1946 the problem of colonial oppression and racial discrimination in South Africa and Namibia. The first ever SWAPO Embassy abroad was established in New Delhi in 1986 and it was this move by India that started the chain of diplomatic recognition by other countries and the inevitability of Namibia’s independence. A retired Indian Army officer, late General Prem Chand commanded the force under the United Nation’s Transition Assistance Group. Diplomatic relations with independent Namibia were established right from the moment of its independence, with the Observer Mission being upgraded to full-fledged High Commission in March 1990. We welcomed the opening of Namibia’s full-fledged resident Mission in New Delhi in March 1994. 6.H’ble Speaker, as Members of this august House are aware, Founding President and Father of the Namibian Nation, Dr. Sam Nujoma, respected Leader of the SWAPO Party for 47 years is greatly admired in India as a world leader and friend of the Indian people. India had conferred upon him the prestigious Indira Gandhi Peace Prize for Disarmament and Development for the year 1990 in recognition of his outstanding contribution in leading the people of Namibia to freedom. Last November, we had the privilege of hosting him as a Distinguished Guest of the Indian Council for Cultural Relations. I recall his inspiring words in October 1992, in Libreville, Gabon at the 17th Conference of the Heads of State & Government: and I quote "There cannot be democracy in an unstable political environment. Neither can there be development in an undemocratic environment…...” Unquote. 7.True to his legacy, Namibia is, today, a shining example of a nation that has repeatedly ensured a trouble-free and peaceful transfer of power from one elected Government to another. Namibia has, once again, proven that a vibrant democratic system offers the best possible ecosystem for inclusive development and growth.Namibia’s commitment to democracy and the success of her national reconciliation programme has made her a role model for Africa. We, in India, admire Namibia's transformation into a vibrant, peaceful and fast progressing nation.We appreciate the vision of His Excellency, President Geingob in introducing the 'Harambee Prosperity Plan'.India stands ready to extend any assistance that Namibia may require for achieving the 'Harambee Prosperity Plan's socio-economic objectives. India would also be happy to partner with Namibia in the implementation of"Vision 2030" through inclusive development and capacity building. 8.I would emphasise that it is the people of Namibia, their unity and their efforts that have made Namibia what it is today: a beacon of hope and motivation, not only on the African continent but in the world. It is a bright spot in the realm of democracy and rule of law; a nation progressing rapidly on the path of development and contributing to peace and stability in Africa and beyond. 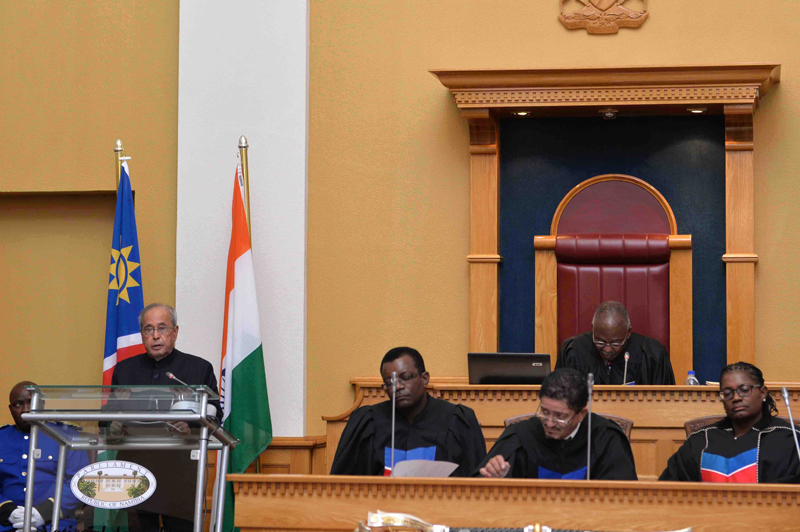 9.We, in India, admire the contribution of the Namibian Parliament in promoting inclusive political dialogue and spearheading Namibia’s developmental agenda. Namibia is one of the few societies in the world that has realised the goal of an equitable gender balance – with a more than decision to consciously focus on the aspirations of your youth is another sure step in the right direction. India firmly believes that it is through investing in its youth that a nation can enhance its capacity to forge ahead towards progress and growth. 11. H’ble Members of this august House,India remains committed to a strong development partnership with Namibia in the South-South framework. We will continue to extend all possible assistance in human resource development and capacity building in Namibia. India’s expertise in IT and digital technologies, agriculture and dairy development can be utilized to further cement our economic partnership. We look forward to more students and officials from Namibia coming to India, availing the scholarships and training programmes offered by our Government. 12.India and Africa were once part of the same landmass until around one hundred million years ago. Today we are neighbours across the Indian Ocean. As Africa rises again to reclaim its rightful place in the comity of nations, India welcomes the growing role of Namibia in driving the prosperity of this region and the continent. 13.We see in Namibia a valuable partner in India's quest for progress and prosperity as we pursue our identical priorities: skilling our youth, eradicating poverty, building infrastructure without damaging the environment, sustainable technologies that save water and prevent desertification, and so on. We are, therefore, united not only by our shared past but, at this moment, by our common aspirations. India and Namibia can achieve much together by building on our synergies. It is indeed a moment of great promise and opportunity for our people. 14.With these words, I extend to you, H’ble Speaker and the H’ble Members of the Parliament of Namibia a very cordial invitation to visit India. Your regular and substantive exchanges with the Members of the Indian Parliament would not only enrich our bilateral discourse but also further strengthen the mutual trust and understanding between our peoples. 15.I take this opportunity, Mr Speaker to convey to you and to the Members of the Namibian Parliament my best wishes for your continued success and the ever greater progress and prosperity of the friendly people of Namibia.